I don’t think you can change a winning side, so I would retain the team which won at Bristol Rovers. I rate Brett Pitman – perhaps something’s going on there which we don’t know about – but Oli Hawkins, inset, up front has been working quite well, despite his lacks of goals. Hawkins’ display against Oxford was the best I’ve seen from him, he was really good when he got into the match. As a striker he will be judged on goals, but he has four assists now. As long as he is in the team playing well and creating then eventually he will start to score. Perhaps Kenny Jackett could go two up front against the weaker sides, with Pitman and Hawkins, although neither have the pace to get in behind. 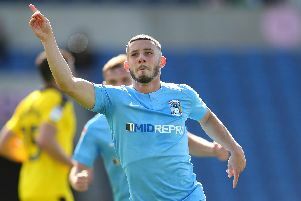 I know the manager tried Hawkins and Conor Chaplin together in pre-season. Still, for Doncaster the Blues should stick to a winning team, certainly I don’t think there is anyone who has come off the bench to warrant a starting spot at present. I like Ben Thompson, who had a really good game against Oxford United and looks like the missing piece from midfield, although I’m expecting to see a bit more from Tom Naylor. Against Luton we were pretty poor and incredibly lucky to get a win. Against Oxford it was a fantastic 70 minutes, before complacency set in at 3-0. I’m positive about this season and have bought a football shirt for the first time in a decade off the back of that. The new kit is quite nice, better than Sondico. Meanwhile, there’s a bit of a rivalry going on for this match – my sister’s fiance is a Doncaster fan!